Kelli: Hey, I just read that while we are in the US in April, Kennedy Space Center will be holding one of its final space shuttle launches. Isn't that amazing?! Mads (as his eyes begin to sparkle): OH MY GOD. Are you serious? Don't remember when we went to the Kennedy Space Center in June 2007 and how I told you that my lifelong dream is to see a shuttle launch? Kelli: Of course I do, skat. You have mentioned it more than once, but Cape Canaveral is quite a trek from Savannah, GA.
Mads: I know, I know. It would just be so cool. Mads: I cannot believe I will be that close to the launch and not able to see it. Don't you think we can find out about tickets or something? Kelli: Sure, but you better call your mother-in-law and find out if she is ok with you taking a little road trip (about 5 hours away) in the middle of our family vacation! later that day ...on Skype.... Mads tells my mom all about his lifelong dream and the launch and some other spacey stuff.... and of course, she said GO! In fact, she suggested that my nephew, Michael, might want to go with him if he was able to get tickets. Mads discovers that there is a ticket lottery that will be drawn on March 9th. So of course he enters. March 9th comes. March 9th goes. No announcement. A few days later he gets the disappointing email that he was not chosen in the lottery to buy tickets. March 18 arrives (US time) and the tickets quickly sell out. Dejected, he starts reading about what he will be missing on that day. Mads: Kelli, it says on here that you can contact your Congressman to ask for tickets. Kelli: Honey, you are not a resident of the U.S. You don't have a Congressman. Kelli: Sure, honey, you write a United States Astronaut and ask him if he can spare a few tickets from this guy from Denmark. Good luck with that. Mads (the dreamer, that is never to be dissuaded without a fight): I am going to try it! What will it hurt? Kelli (the pragmatic half of the couple) : Honey, I just don't want you to get your hopes up. The chances of that happening are somewhere between SLIM and NONE. That was on Wednesday, the day he emailed the astronauts. Remember that email he sent on Wednesday.... well today he got a REPLY. A REPLY FROM JON MCBRIDE.... THIS GUY-- former space shuttle PILOT. So today I admit that sometimes it is a VERY GOOD THING to be hopeful and optimistic like my Viking is... his optimism just got him a first class ticket to the launch of the Endeavor on April 19. A day one of his dreams will come true! PS. You look absolutely gorgeous in that photo, Kelli. That is such a cool story - and it just goes to show that you should always follow your dreams. I love it! That is SOOOOOO AWESOME!!!! Wow! take bunches of pictures! That is one for the scrapbooks, for sure! 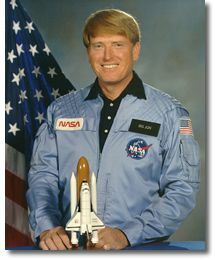 Too cool, but isn't this ex-astronaut's name Jon McBride rather than Jim McBride? Very very cool! Yay Mads! That is great Kelly. My Father-in-law works for NASA and we just saw the latest shuttle launch with our 2 kids. It was breathtaking. I feel a real connection to you as I was an exchange student in 1990 in Roskilde for a year. One of the best experiences I have ever had as a young American from South Carolina. My brother and I inherited a little condo in Titusville right on the water. It's a great place to watch the launches! Jon, that is awesome!! Look for a bald Viking and 2 teenagers on the launch day!! :-) They will be in your neck of the woods!